It's been quite a few months since my last eye cream post (read here) so I felt it was time to do an update on what I have been using. Because my biggest skincare concerns are not typically with my eye area, I tend to stick with products I enjoy rather than constantly testing out new ones like I do with masks and cleansers. However, the one thing I do know from the testing I have done over the years is that I enjoy layering eye creams - using both a serum and cream together. 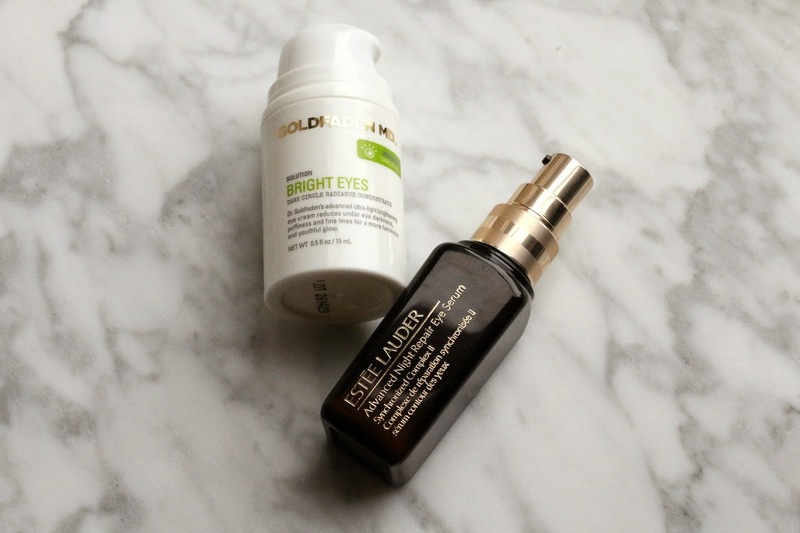 Currently, I am using the Estee Lauder Advanced Night Repair Eye Serum and the Goldfaden MD Bright Eyes together for both morning and night. Occasionally I will still bring out this eye cream from Tatcha, which I love and this one from Perricone MD, but the Estee Lauder and Goldfaden MD have been in regular rotation for quite a while. 1. Estee Lauder Advanced Night Repair Eye Serum - Since I have never tried the original Advanced Night Repair for the face (I know, I am so ashamed), I was not sure what to expect from the eye serum. However, as soon as I began using it, I was instantly in love with how it felt on the eyes and the results it gave me. It's designed to basically target all the concerns possible - fine lines, crow's feet, dark circles, puffiness and dryness. The texture is lightweight and layers beautifully under any eye cream I use as well as under makeup. I find that it helps my eyes stay looking great - and targets any and every concern I have which is mainly preventing fine lines and occasional puffiness. 2. 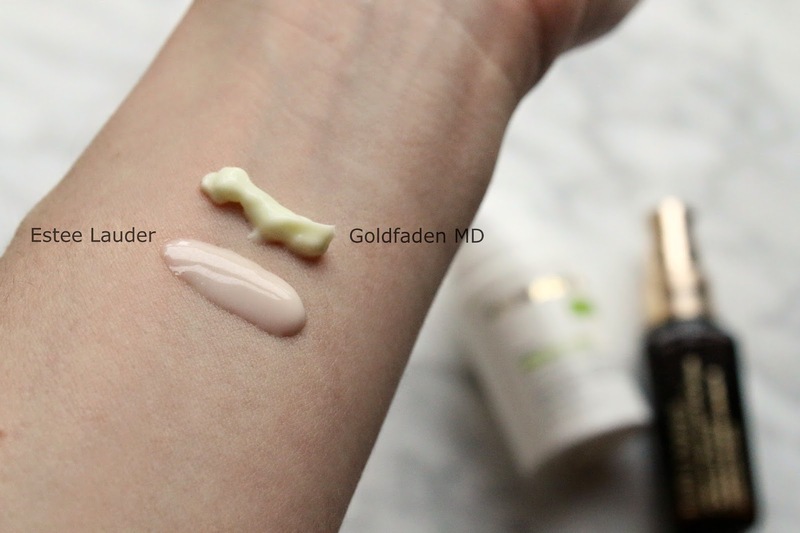 Goldfaden MD Bright Eyes - While the Estee Lauder serum helps to address a lot of my anti-aging concerns, the Goldfaden Bright Eyes is a great complement to it by giving me the hydration, nourishment and brightness that I need. The formula is a bit thicker, as you can see from the above picture, and really helps to deliver intense hydration while at the same time leaving the eye area looking luminous and bright. I can feel a slight instant firming effect when it's first applied (it's very minimal but it's there), and now that the temperatures in NYC have gotten frightfully cold, the rich texture is a welcome relief each morning and night. When used with the EL serum, the combination really helps to give my eye area the full royal treatment. So which did you prefer for undereye circles (my personal ongoing nemesis) specifically?